I’m excited to share my Nighttime Skincare Routine with you today. A few weeks ago, I shared my Morning Skincare Routine. I’ve received so many emails about it. This routine works for me and garners me comments on my skin daily. I am a big believer in taking care of yourself inside and out. I posted this on Instagram Stories a few months ago and a got several comments back that said, “That’s a lot! You really do all that?” Yes, there are multiple steps BUT it truly only takes me 5 minutes or less morning and night. I know I said in the last post that I’m trying to avoid cosmetic procedures but that doesn’t mean I dislike them for others. It’s just not for me. I’m equal parts scared of the side effects ie. looking worse and not overly interested. To each her own in this area. I’m just sharing my routine because I get so many questions. Colleen Rothschild Cleansing Balm: I love the luxurious texture and aroma therapy of this balm. I us about a nickel size amount of the balm and work in circular motion on my face and eyes. Keeping my eyes closed, I use a warm wet cloth to remove every bit of make up. I love hydrating and cleansing in one step! Again, I use the REN Ready Steady Glow Daily AHA Tonic. I’ve loved everything I’ve tried from this clean beauty brand from the UK. This great toner helps to minimize pores and removes any lingering dirt and make up. I love the light citrus scent. Their primer is one of my favorites. You can learn more about it here. 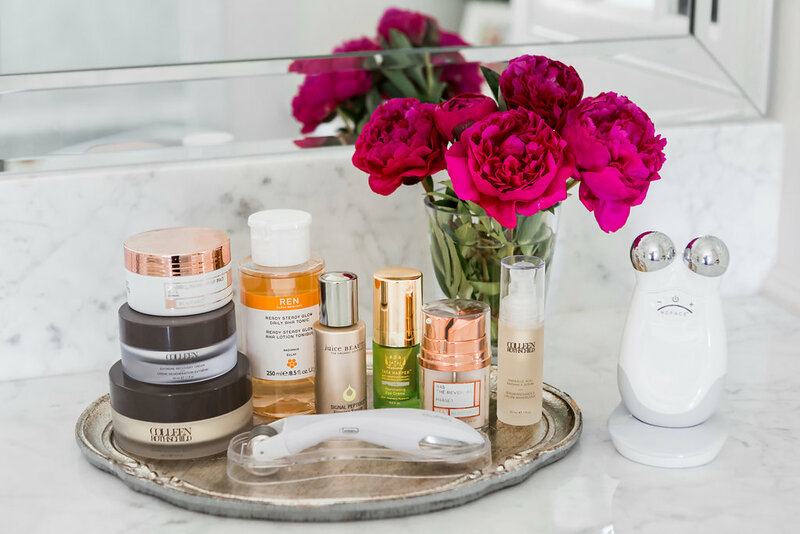 Beauty BioScience GloPro: This is the KEY step in my nighttime routine. I use the GloPro Skin Prep Pads and then my favorite device, the GloPro. The GloPRO features microneedling paired with Red LED wavelength technology and VibroTactile Stimulation. Microneedling taps your skins own regenerative power by forcing new collagen production and immediate cell turnover. 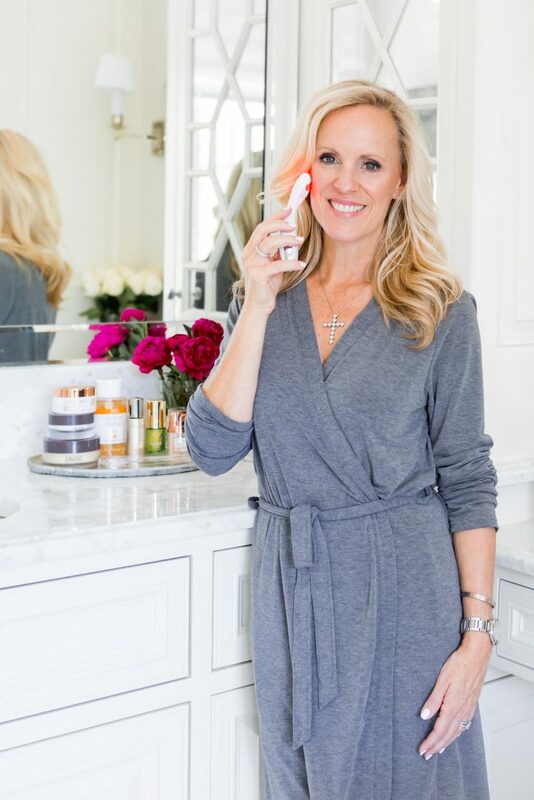 Wavelengths of red light help improve skin’s barrier function, serves as an anti-inflammatory treatment to help with uneven skin tone and redness, and also improves collagen production and density. Collagen is what keeps our skin plump and youthful looking. The GloPRO vibrates as it works to help reach deeper layers of your skin. You can learn more about the GloPro here. After my skin is prepared for maximum absorption with the GloPro, I use the Juice Beauty Signal Peptide Serum. 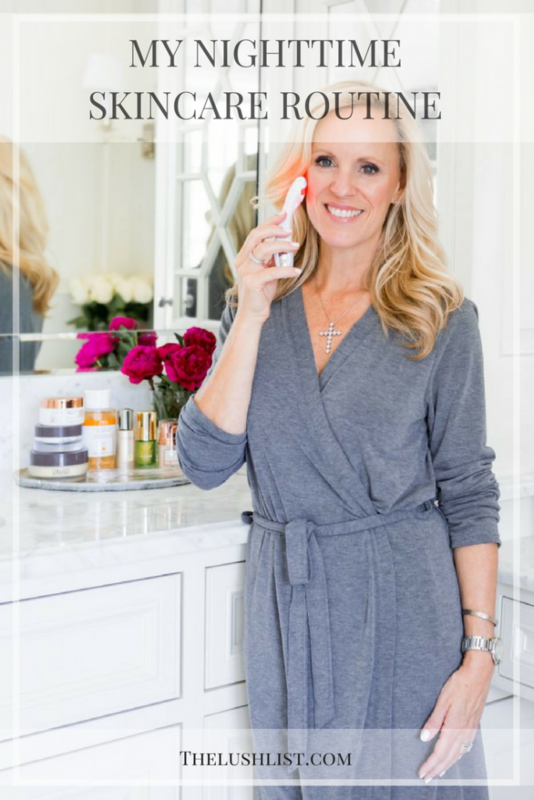 I love the results of this serum and it is also part of my Morning Skincare Routine. Next, I use Colleen Rothschild Mandelic Acid Radiance Serum. 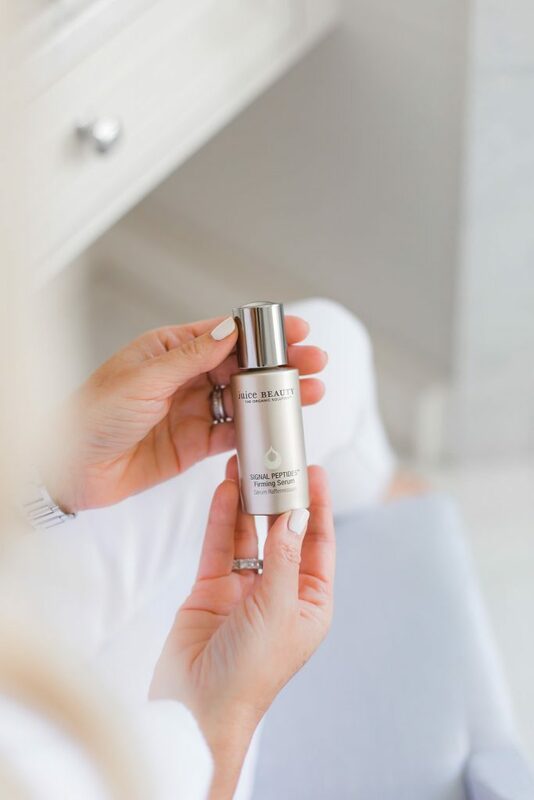 This lightweight acid serum is formulated to promotes cellular turnover, which addresses photo-aging, fine lines, acne, dark spots and overall skin texture. It is gentle enough for sensitive skin. 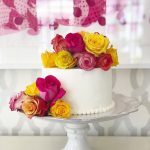 It has lychee oil as an ingredient that give is an beautiful fragrance as well. 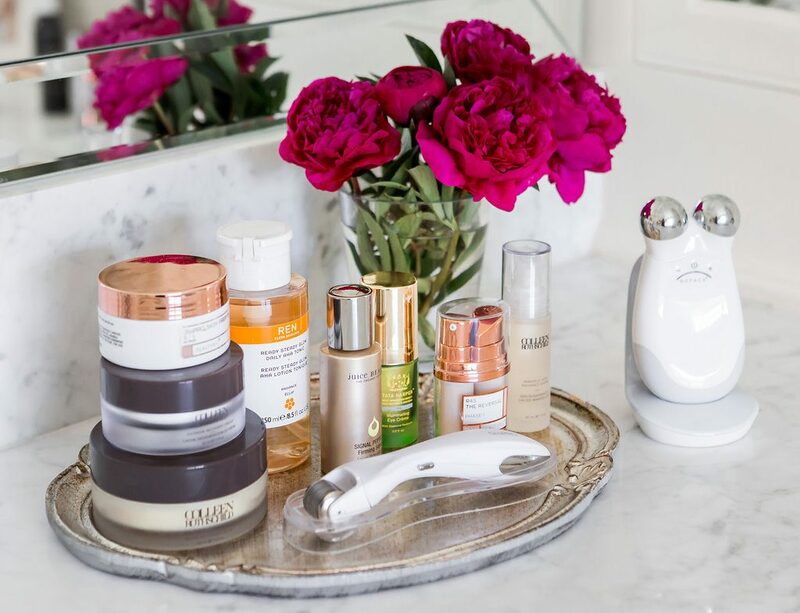 You’ll also notice the Beauty BioScience R45 Serum above. This is an 8 week treatment that you do twice a year for intense cell turnover. I’ll be sharing more about it soon. I am in the middle of week 4 and my second round. I LOVE this serum! I use this in place of the Mandelic Acid Serum when I use it. My final step is the Colleen Rothschild Extreme Recovery Cream. This medium weight cream is luxurious but not overly heavy or greasy. It was created to deliver intense hydration. Occasionally, I add an oil like Activist Skincare’s Custom Facial Oil. 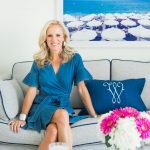 This Dallas beauty company created custom facial oils and donated a percentage of sales to charity. Lastly, I end with the Tata Harper Eye cream that I love so much for day also. Once or twice a week, I have started using my NuFace Trinity again. This handheld device uses microcurrents to create a facial lift. No one wants sagging jowls, eye brows or forehead, right!?! You can read more about this skincare tool and how I use it in this post. I do this step prior to the GloPro and serums. Today, the Colleen Rothschild Friends and Family Sale began! All my favorites from Colleen are 25% off with Code FRIENDS25 until Sunday! I love that you’ve also shared your favorites on the Morning Skincare Routine post. I hope you’ll do that here as well! I love finding new products other love. You have so many nice products. I would like to try the Nu-Face if it gets rid of my jowls! I would also like to read your review on the Bio-Science R45. Bio-Science is introducing so many products that it’s hard to know what to choose. I don’t have a specific skin care routine, although I do something every morning and evening, but I like to try and add new products after using a regime for about 3-4 months. Thanks for all the great recommendations, and yes, you do have beautiful and glowing skin.